Come along for legendary adventures with the first two books in the Heroes in Training series, now available in one action-packed flip book edition! The terrible Titans are merciless giants who rule the earth, led by Cronus, the biggest, baddest Titan of them all. 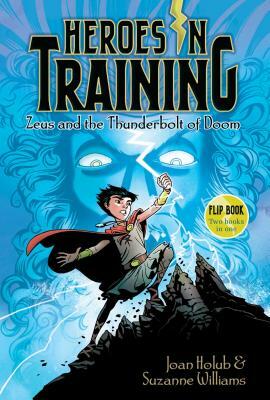 Cronus and his cronies have put the world into chaos—but the Titans’ rule is about to be challenged by a group of young Olympians, led by ten-year-old Zeus, as they discover their powers and try to claim their rightful place as rulers in various realms of the universe. This paperback bind-up includes Zeus and the Thunderbolt of Doom and Poseidon and the Sea of Fury.